Same Day Delivery, Inc., a Michigan based corporation, was established in 1985 with the foundation of hard work, outstanding customer service, and a single cargo van. Since then, Same Day has grown to a fleet of over one hundred vehicles, including cargo vans, sprinter vans, straight trucks, flatbeds, and tractor trailers and services over a thousand customers throughout the Great Lakes Region and beyond. Headquartered in Grand Rapids, Michigan, a live dispatcher is available 24 hours a day, 7 days a week for each and every shipment of yours. 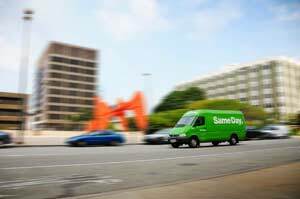 Same Day Delivery provides expedited, dedicated, cartage, courier, LTL, P&D, brokerage, and warehousing services throughout the Great Lakes Region. With our over twenty-five years of business experience, dedicated team of employees, professional drivers, late model equipment, and state-of-the-art dispatch technology, we are well equipped to handle any of your logistics needs.